Mackinac Island, Michigan is a biker's delight. No cars: only horses and bikes. So hoping on a bike on Mackinac Island means endless miles of trails without cars. Mackinac Island is 8.2 miles around and the ride is flat with spectacular views across Lake Huron along the way. Stop at Arch Rock or British Landing along the way. But riding around Mackinac Island is not the only way to ride here. Miles and miles of wooded trails throughout the Island make for spectacular riding and hiking. Hop on a bike (rent one or bring your own) and head past Fort Mackinac, Grand Hotel, Stonecliffe, Wawashkamo Golf Course, Arch Rock, Fort Holmes, or the East and West Bluffs. 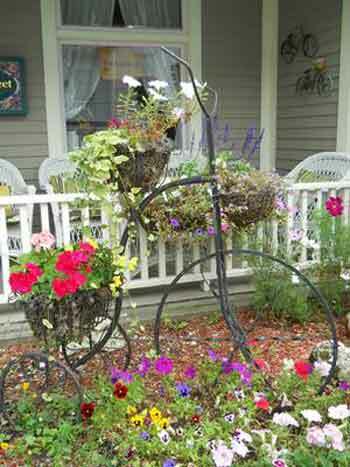 Biking on Mackinac Island is glorious spring through fall. Plan on spending hours and hours--and bring the camera--on Mackinac Island on your bike. This is the place to ride.